Location: Lunch provided on site. 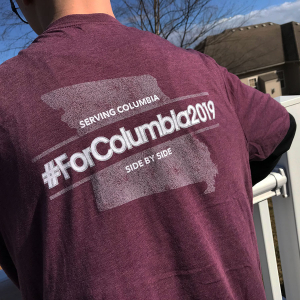 One of the ways ForColumbia strives to love and serve our neighbors is by partnering with our city in ways that put us in touch with those who are more marginalized in our city – the chronically poor, the elderly, single-parent households, those with disabilities. This year we are serving significantly in housing managed by the Columbia Housing Authority (CHA), by sending hundreds of volunteers into public housing areas. Part of this effort includes working at J.W. Blind Boone Community Center. Blind Boone centralizes the youth education, resident services, and family self-sufficiency programs provided by CHA to public housing residents. CHA’s Moving Ahead Program works with children in kindergarten through 8th grade living in public housing and adjacent neighborhoods, providing healthy snacks, help with homework and tutoring, as well as other enrichment opportunities. The staff at this community center work hard in the lives of low-income families, and we believe our efforts on April 28 will encourage not only the kids and adults who use this facility, but the hardworking staff as well. This is why we believe your day will be well-spent serving at the J.W. Blind Boone Community Center. other projects to be identified. All basic cleaning supplies will be provided by ForColumbia. If you can bring rubber gloves, brooms, dustpans and/or mops. Please let your site leader know. Yes, older children who can assist in this project are welcome to participate.